Publish all news about your band, music etc. The biography is the signboard of your music. Therefore, fans get to know you easier. The radio of your website will provide you with information about recent activities. Photos freshen every website. Create an album of your gigs, recording etc. The heart of your website, the music! Easy integration of mp3-files. Videos attract fans and vivify the website. Upload avi/mp4-files or integrate frames. Do you have questions, comments, problems or do you want to report a bug? Click on Menu >>Create a ticket , enter your request and we will help you as soon as possible. On >>My tickets , you can read already created tickets and our answers. 1) Headline / subtitle: You can enter a short subtitle under your headline. If you tag it as “top news”, news will be listed at the very top of all existing news. 2) Text length : Nobody likes text consisting of 50 rows without any subparagraphs. 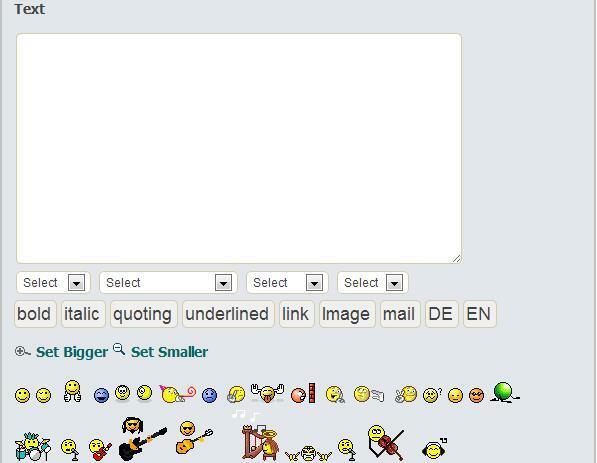 Use the enter button and use formatting like font size, colour, “bold” etc. That is how your text will look more attractive and will be rend with pleasure. 3) Add images : The more images you add to the news, the better. Images help to create exciting news. You can add images to the left and/or right of your news. 4) Send off / reset news : Finally you only need to click “Confirm” and your news will appears for all readers of your website. If you discover any mistakes in your news, you can click “Reset” to write your news again. 5) Take your time : Pace yourself while entering the news and control your text (spelling errors etc.). Only send off your text when it´s really done and perfect! 1. Source citation: We ask you to enter all source citations at the end of your news. Even if it seems time-consuming, it might prevent you from troubling yourself. 2. Mind the copyright: This applies to images, texts and other contents of your news. Please check if contents can be broadcasted. If you would like to add images, just paste the link. We will save the images and add them to the news. Please mind that the contempt of these rules will lead to non-publication or deletion of the concerning! The biography is another part of the "Corporate Identity" and has to fit to your band as well as photos, music and lyrics. Admi Hedly, there is no sample solution for a perfect band biography. However, we can give you some general advice. 2. >>How to write a good biography? 3. >>What else do I need? The biography is your visiting card. Mostly, it will be the first to which a record company, journalist, sales department or other will look at other even before having listened to your music. People should fancy your band after having rent your biography. The biography has to emphasize that your band isn´t common. That it is worthwhile to deal with your band and music. That is why it’s profitable to invest time and efforts for a good text. 2. How to write a good biography? This question can be answered by two ways. Either by telling mayor elements or by telling everything which would make up a bad band biography. Simply like Mark Twain´s motto "Writing is easy. One simple needs to avoid the wrong words." As musicians, of course you know it isn´t that easy. After all you don´t write a great song by simply avoiding wrong notes. However, we can still recommend the main features of Twain´s quote because it helps a lot avoiding capital greenhorn mistakes. "Mike, Jack and Fred first met each other at a concert of their favorite band "Creator" in 2003. After having drunk a lot of beer, they decided to found a band. A name for the new band has been found quickly: "Total Tank". An introduction like this one and every A&R of a label would have tossed the sample CD into the trash immediately. Every journalist would have been happy to write negative critics. The introduction is inexpressive and hundreds of biographies broken up bands have already begun like this one. It is like every good article, interview or book: The introduction, the beginning has to be exiting. Otherwise one will lose the reader and audience. b) must not be entirely outworn and obsolete. Neil Young’s “It’s better to burn out than to fade away” and Nietzsche’s “Life would be a delusion without music” are great quotes indeed, but are used already way too often. So it is preferable to do without quotation or at least to invest some time in research to find a really good quote. The plain first sentence follows a “twisting” second sentence containing the fact that the sisters are conjoined twins. Of course it is a faked up story, but this example shows how one can “play” with different styles. So use the expectations of your readers: After such a plain first sentence most of your readers would put you in a “boring corner”, but they would be positively taken by surprise by the striking second sentence. This gets caught in the reader’s memory. The beginning succeeded and the reader’s attention is assured. Now it is important to keep and to increase the attention if possible. You should mind the old proverb “Brevity is the soul of wit”. Such biographies do really exist! Unfortunately, people are not interested in such biographies. Except the year of foundation, there is no single relevant information. Plus it is entirely uninteresting when somebody assisted as a bass player for just a couple of weeks – except your band is called “Coldplay” or “Genesis”. If you don’t have something interesting to say, don’t tell it! Concentrate on a “crunchy” briefness. This means you mustn’t outrun a total length of a DIN A4. Three quarters of a page can be considered the optimum length. A biography certainly servers to advertise your band and to make the sender to be amped up about your music. However, this has to be done in a cunning and subtle manner and mustn´t sound too arrogant. Always mind: These, who read your biography, have probably read a vast number of “The savers of Rock”, “The new power of Black Metal or “The next Queen of Pop”. You “praise” your preferences most originally and enterprising. This is how to avoid sounding like boasting fools. Nobody wants to know anything about a six month old band which supposedly has what it takes to be the next big superstar band like the “Beatles” or “REM”. Stay honest and authentic and use the artistic licence to prettify the facts. Make clear that your are solid for whatever you do! Outline this by writing a little story about a revival experience or your musical career. Did you succeed already at any competitions or voting’s? Then mention it but don´t let it sound cockily at the beginning of your biography. Arrogance and pride as a rhetorical device only work out if them quality for your band. Furthermore, comparisons can be helpful to explain your music to strangers for now. It is not all about sounding like “AC/DC. It is about giving a general orientation. This is why comparisons should be used scarcely and carefully. “If Pete Steele and Sigur Ros would have made music in 60s together, we would sound quite similar” Sounds much more refreshing than “hard and physical rock for all fans of Motörhead”. If you get along without any comparisons – just as well! It is much more original to describe your music without the aid of popular band names. However, it is more difficult, too. This would be a classic own goal. Eventually, you don´t want to sell yourself at less than fair value. Mentioning that giving concerts would be an essentials part of your band would be completely sufficient. If anyone wants to book your band, the one will do it but not because you were beginning for a gig. If you preferable to end with a fitting quote. We recommend an open end for your biography anyway because you will want to show that your story has just begun. 3. What else do I need? These called “Selling Points” lists are still very popular in the end of a band biography. Please save these pains. Most often these lists are written in the end of biographies of bands which sparkle of absence of selling arguments. Weave your arguments into your text instead of racking the reader´s never by arguing “for fans of Bon Jovi and Nickelback” or “with ex-members of Total Tank”. Less is more! If is preferable to end with an outstanding sentence like “you will never really forget the day that you almost caught Captain Jack Sparrow! 1st: A good biography saves the most important at the beginning: The attention of the reader. 2nd: The introduction has to be exciting, otherwise one will lose most of the readers and the audience. 3rd: If you don´t have anything interesting to say, don´t tell it. 4th: Tell your advantages in a most cunning and subtle manner. Finally you don´t advertise not only your music but yourself as artists. 5th: Less is more: Concentrate on “crunchy” briefness. 5. Check list: What comprises a band biography? A last hint: If you think that you are not capable of writing an own biography, contact a competed author. Possibly it will cost some money, but might be worth it. Of course you can always contact the my-bandpage team. 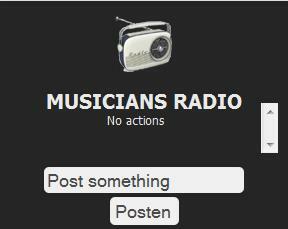 The „Musician Radio” provides you with information about current activities on your website. It helps you to respond quickly to your fans. Fans will be happy to have a better connection to your band, music, gigs and also to your website. Furthermore, less information will get lost if there is a short info text on your main page. • When did who log in? • Where has a comment been added? • Share information directly by the Musician Radio. Attention! After entering, the info’s will be visible for only 48 hours. Fans love images! How was it at your last gig or at the recording studio? Create your photo album on your website. Please mind the mandatory fields which are tagged by asterisks (*). Go by the menu “Admin” to “Add pictures”. 2. Choose file path (single file), formats and category. Enter the correct file path (single file). The perfect size of an image of 600X400 is not mandatory. However images need to have the png, jpg or bmp format and must not exceed a total volume of 4 MB. Add a title for your image, so that one can easily associate it. The specification of the category (mandatory field) lends to a better orientation of the viewer and turns photo collections into an album. 3. Comment an image. You can also write and add a comment to your images. Who was the photographer? Where, when and why did this photo occur? There is always a lot to tell. Nevertheless, “less is more” because the image is already a story. 4. Entry into the album and reset the entry. Check the entry if it really correct before you add it to your album. If you should discover mistakes (f.ex. wrong image), you can click “Reset settings” and rewrite your entry. 5. Upload several images as ZIP file. If you would like to add several images to your album, you can also use the ZIP file feature. Just choose the folder of your photos and convert them into a ZIP file (curser over file name → ZIP folder). Then just add the ZIP file and upload it. Please respect the copyright! Copyright can apply to images, audio and video date, texts and other content of uploaded data to your website. Please make sure you have the permission to use and publish this data. Don´t forget to insert a link with a reference. We will save it add it to your album. Please mind that we will not publish and delete the concerning content if disregarded! You have three possibilities to add MP3 music files on your website. Depending on the file size, you can send them by email or, if bigger files, you can upload them directly by a FTP client to our server. You can also add them as a frames file on your website. You will need additional programmes to use frames or FTP. But don´t worry, we will explain the single steps of each possibility in detail. Please always mind that files have to be added / uploaded in MP3 format. There are many programmes for free (converters) to pack the often huge volume of video files. There are many possibilities to upload your music so new here in the Internet, so that you can copy and paste it onto your website. 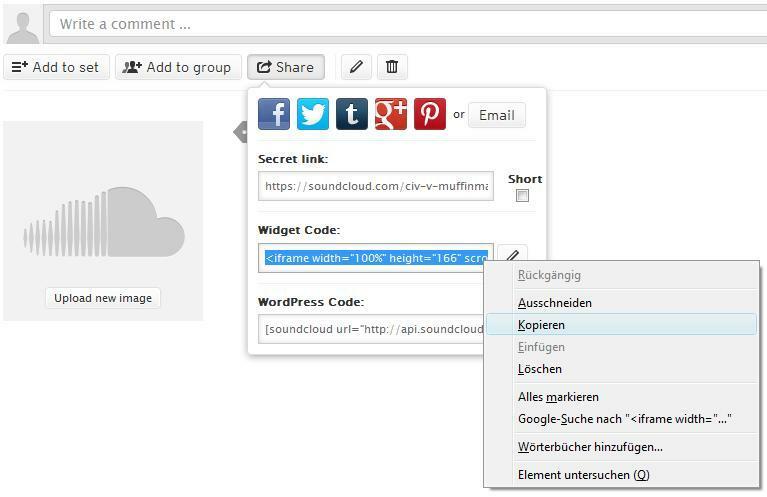 We use for example the internet service “soundcload.com”, which is the most popular platform to upload music files. As well as videos on YouTube, you can easily and quickly upload your music. Afterword´s you can “frame” your file. 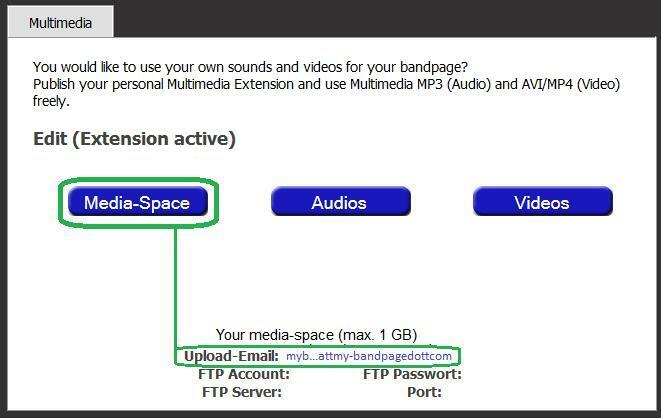 Step 1: After you have signed in on soundcload.com successfully and you have chosen a genre at the welcoming window, you can start uploading your music files immediately. 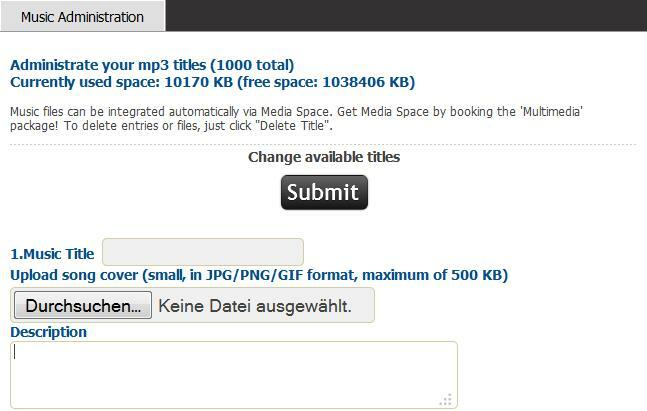 • Above on the right: Click on “upload” and there will appear a request either “to choose files to upload” or to “start new recording”. • Click on “Choose files to upload” and there will open a window for the data on your computer. 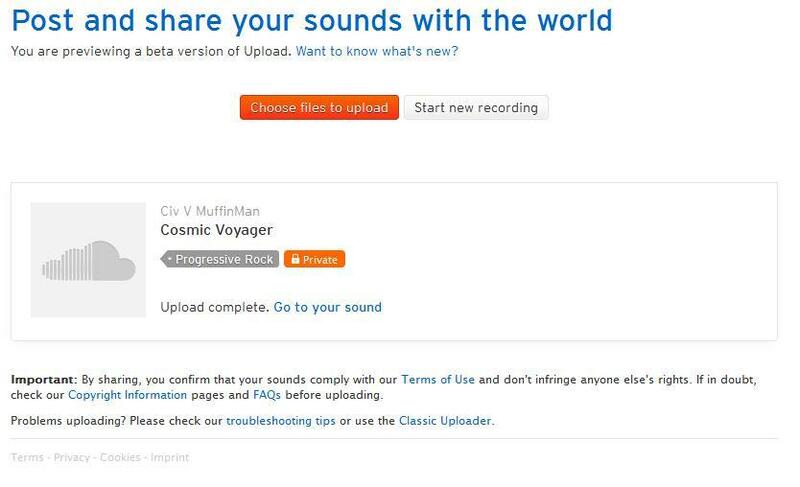 Then choose a music file and start the upload. • Check after uploading, if your entered information is correct and save the file. • You will now be able to see and use the uploaded file. You will want to copy and paste the frame. Click on “go to your sound” which will lend you to the choice. • Push the button to copy (right mouse click) the frames file “Widget Code”. Step 3: Finally you only need to paste the file on your website. Therefore open “Admin -> Edit audio (MP3)” and add (again right mouse click) the file into the frame window. • Click on “Confirm” and your file will appear on your website. To upload your music onto your website by email is the fastest and easiest method. Simply send your music file as an attachment to the email address stated on your website. Unfortunately, most email providers offer only a very limited memory capacity, usually 20 MB. This is why this method is only suitable for smaller music files! Where to send the email with my music file? You will find your personal sending address in the Media Space of your website. 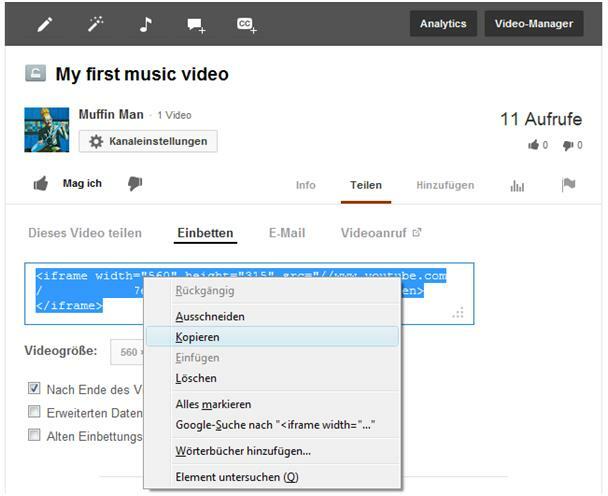 • Open “Extension -> Multimedia” and click on Media Space. • Below you can find your uploaded email in blue writing, to which you have to send the email with the attached music. You can also upload your music directly on our server of my-bandpage.com. The difference is that you have to create your own FTP Client. The advantage is that you don´t need to register elsewhere but to connect directly with our servers of my-bandpage.com. Simply we a search engine and enter “download FTP client for free”! You´ll find many providers. For our example we use the FTP client “FileZilla”. How can I connect my FTP client? To connect with the server you will need the access data. You will find the data in “Media Space” on your website. The access date will only be visible for band administrators. 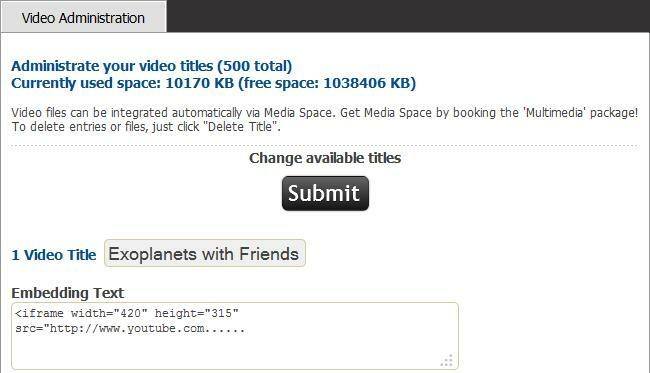 • Open “Extension -> Multimedia” and click on “Media Space”. Enter your access data into your FTP client! The client will save the access data, so that you only need to enter it once. For the next connection it is sufficient to click on “Server-reconnect” above. 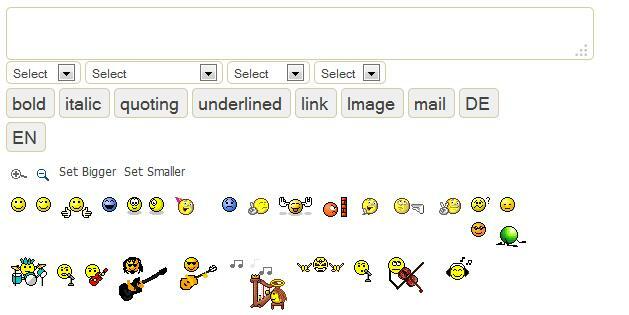 • Choose your certain music file from your index. • Click on “upload” by right mouse click and the transmission will begin. The data will be checked before processing! There for the deployment of videos can take up to 24 hours. Please be patient. Please respect the copyright! Copyright can apply to images, audio and video data, texts and other content of uploaded data to your website. Please make sure you have the permission to use and publish this data. Likewise the MP3 files, you have also three possibilities to add MP4 video files on your website. Depending on the file size, you can send them by email or, if bigger files, you can upload them directly by a FTP client to our server. You can also add them as a frames file on your website. Please always mind that files have to be added / uploaded MP4 format. There are many programmes for free (converters) to pack the often huge volume of video files. Not each video file is a MP4 file. Mostly own records or DVDs have to be converted into the right format. You can easily find converters in the internet. They are easy to handle, too. Just enter “video converters for free”. Please always make sure that you convert video files into MP4 files. YouTube is most likely the most common platform to upload videos. You only need to sign in and you can get started immediately. How to upload is explained there very well. 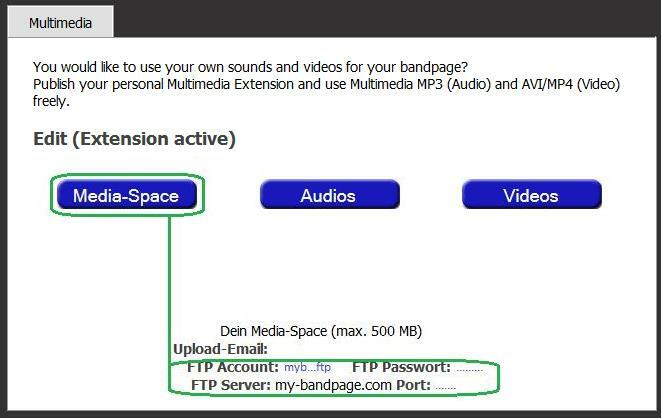 But how to add a YouTube video on my band page? Step 1: After having been registered and uploaded your video, you can copy your frame and add it on your website. • On “Share -> Insert” you will find the frame text of your video. Tag and copy it. In the end you only need to paste the file onto your website. • Hereto open “Admin -> Edit video (MP4)” and paste the frame text into the blank window. • Now just click on “adopt” and the frames file will appear on your website. To upload your videos onto your website by email is the fastest and easiest method. Simply send your video file as an attachment to the email address stated on your website. Unfortunately, most email providers offer only a very limited memory capacity, usually 20 MB. This is why this method is only suitable for smaller video clips! Where to send the email with my video file? • Below you can find your uploaded email in blue writing, to which you have to send the email with the attached video. You can also upload your videos directly on our server of my-bandpage.com. The difference is that you have to create your own FTP Client. The advantage is that you don´t need to register elsewhere but to connect directly with our servers of my-bandpage.com. • Open “Extension -> Mulimedia” and click on “Media Space”. • Enter your access data into your FTP client! • Choose your certain video file from your index. Eric Sohn ist Vocalcoach der Acapella-Band "Wise Guys", Dozent und Professor an der Kunsthochschule für Tanz und Musik in Köln. Im Eintrittspreis ist die Option enthalten dem Workshop als gast beizuwohnen.